Offered here is a Dallas Cowboys Game Used-Game Worn Southland Athletic Jersey. A third-round draft pick at linebacker for the Cowboys in 1969, Tom Stincic was a member of Dallas' Super Bowl VI squad. 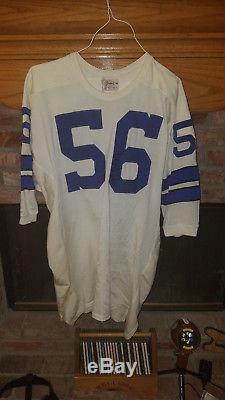 Presented here is a beautiful white Durene Cowboys jersey worn by the Michigan alum in the early 1970's. All original, it is accompanied by a letter of provenance from the son of Bobby Franklin, who was an assistant coach in Dallas from 1968-72. 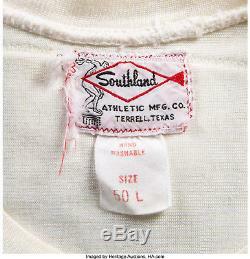 The proper Southland size 50 tag is in the collar, while its original nameplate remains intact. Letter of provenance from son of Bobby Franklin. 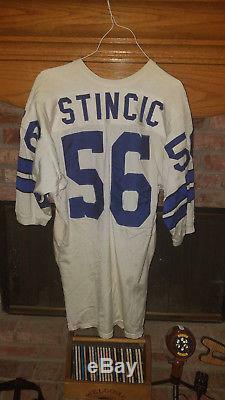 The item "Early 1970's Tom Stincic Game Worn Game Used Dallas Cowboys Jersey with Letter" is in sale since Monday, October 22, 2018. This item is in the category "Sports Mem, Cards & Fan Shop\Game Used Memorabilia\Football-NFL\Jerseys". The seller is "dalcowgamejerseys" and is located in Granada Hills, California. This item can be shipped worldwide.